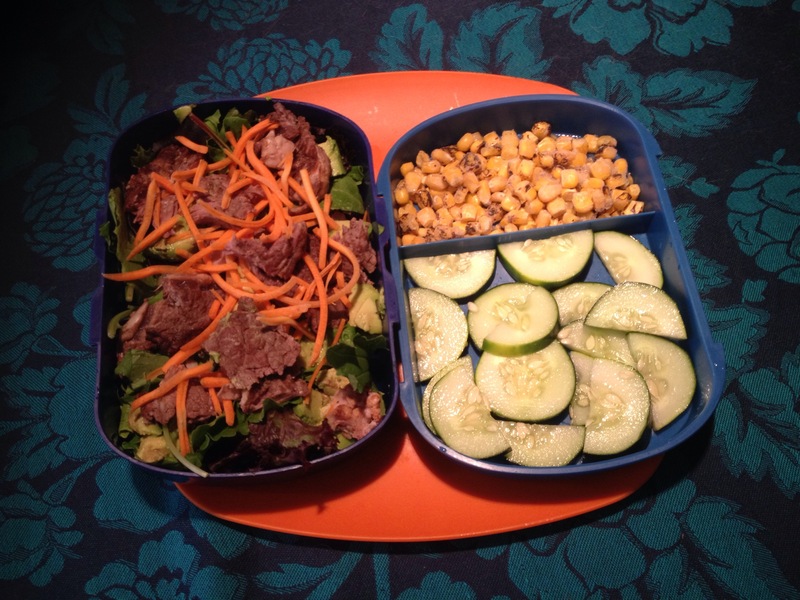 Lee Makes Lunch | I make bentos for my lunches to take with me to school and work. The idea is to ultimately create a tasty and healthy meal that incites lunch envy. Nutrition is important, as are color and presentation. I make bentos for my lunches to take with me to school and work. 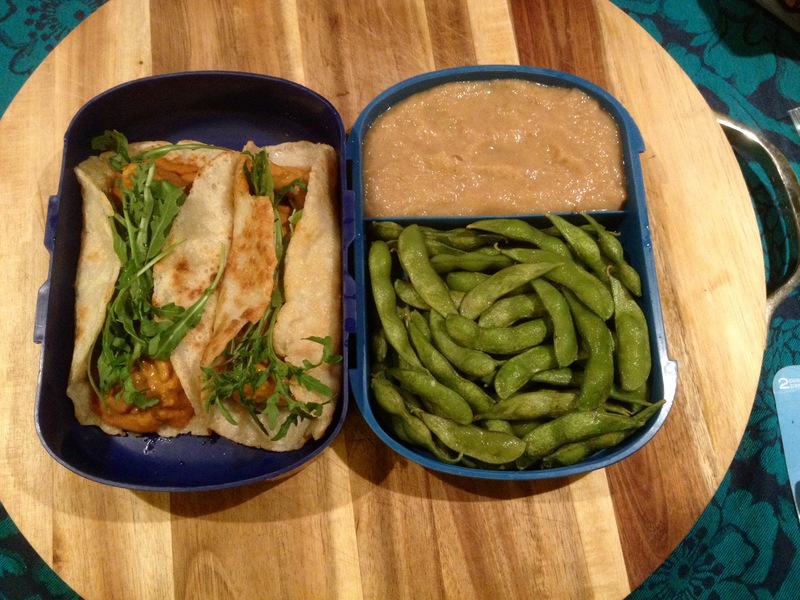 The idea is to ultimately create a tasty and healthy meal that incites lunch envy. Nutrition is important, as are color and presentation. Here in the Southland (“that-y’all-and-shut-my-mouth-land”), we have a time-honored tradition of eating black-eyed peas, collard greens, and cornbread on New Year’s Day to symbolize prosperity in the coming year. I always have the best of intentions to make a variation of this combination, but usually by the end of December I’m tearing up, trying desperately to keep my eyes open so I can actually make it to midnight. I typically pass out around 10:50pm and am then mocked relentlessly for the next week by my loving boyfriend. However, I broke tradition in 2016! I made it to 12:15am after many cups of cold brew coffee that afternoon, and on New Year’s Day I finally made a big ol’ pot of Black-Eyed Pea Soup with Andouille & Collards. I had some smoked andouille from Patak, the amazing Bavarian butcher in Austell, in my freezer that I was saving for gumbo, but I figured I could always make another trip to get more. The frozen bag of black-eyed peas I bought was also two pounds, so I’m sure they’ll make another appearance on here soon enough. The soup is quite hearty, filling, and spicier than I thought it would be. The slice of gluten free Trader Joe’s cornbread I baked last night helped provide some contrasting sweetness as well as sopping power. I used less broth than the recipe called for because I wanted more substance than abundance. I have learned my lesson with cooking bulk stuff. Leftovers are fun for about two days, but by the third you end up staring at it, waiting for it to disappear on its own. Unless it’s tikka masala. Until next time! Hope everybody has a great year with happy bellies! With the autumnal weather rolling in, I get really excited about warm flavorful food. Thus, this bento is a testament to some of my latest tried and true favorite dishes! To the left is homemade chicken tikka masala with arugula, wrapped in paleo naan. My mom found this recipe for the masala sometime last year and it has now become somewhat of a family recipe. She knows how to make it, I know how to make it, and my 15-year-old sister knows how to make it, so much so that she goes over to her friends’ houses and makes it for them! It calls for ghee and heavy cream– delicious fats that help it develop the perfect textures, flavors, and aromatics of what I would order at a restaurant. Instead of a small portion of leftovers eagerly gobbled up the next morning, it makes enough that we eat it for most of the week. I’ve made a few tweaks to the recipe by adding a little more turmeric to help it get that nuclear orange color since turmeric doesn’t alter flavor very much. I highly encourage using boneless skinless chicken thighs instead of chicken breasts, as well. I now always make sure to have the spices it calls for in my pantry so I only need to buy one container of heavy cream and a can of tomato sauce to just make it on a whim. The paleo naan comes from a My Heart Beets recipe and is made with almond flour, tapioca flour, and full fat coconut milk. You make the batter and cook it on the stove like a pancake. I can usually get about four decently sized naan out of one batch. It’s great for a gluten-free accompaniment to curry that isn’t rice. To the right is some homemade applesauce that I am very proud of. I looked at Alton Brown’s recipe for applesauce and loved all the ingredients in it, but, as I may have mentioned before, I get wigged out over microwaving anything for more than 5 minutes out of sheer terror that I will set my kitchen ablaze. So I looked up stove-top recipes for applesauce and combined the two ideas with some adjustments. Slice up all the apples and throw them in a big pot. You don’t have to peel them unless that is what you prefer. Add all the ingredients together, put the lid on, and bring to a boil. Bring the heat down and simmer for about 30 minutes until all the slices are tender. Then get out your trusty immersion blender (or potato masher) and blitz (or smush) the whole pot until it is all creamy. Consume with fervor. 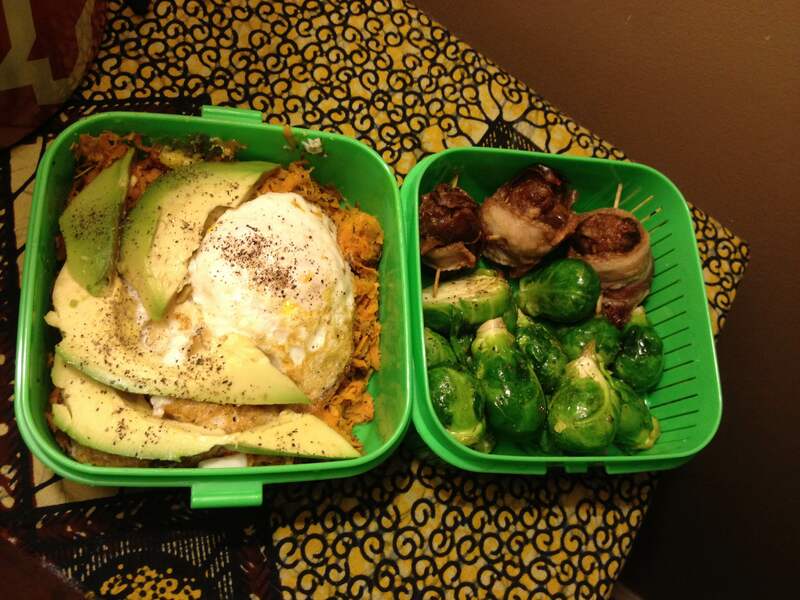 For this bento, I made sweet potato hash with a fried egg and some sliced avocado. I added some vibrantly green roasted Brussels sprouts. When roasting Brussels sprouts, I try to pick out a bag of small ones so I don’t have to cut them up to have them cook evenly. Since I buy them pre-bagged most of the time, I will open the top of the bag as gingerly as possible (kitchen scissors really help) and pour in some olive oil with a fairly generous dash of salt and pepper. Holding the top tightly, I will then shake it to evenly coat all the sprouts and then roast them in a pan at 400 for 20-25 minutes so they get nice and crispy. I wouldn’t eat Brussels sprouts for the longest time because they would always turn out bitter and funky, but this has helped transformed them into something much more palatable. The true stars of this bento are the chorizo-stuffed dates wrapped in bacon! I tried them at a local restaurant in Decatur and they were phenomenal. And like all things I try when I go out to eat, I immediately wanted to try making them at home! I bought some freshly sliced bacon, a pound of chorizo, and two small containers of dates at the Dekalb Farmer’s Market. I followed this recipe but made a few changes. When wrapping the stuffed dates, I tried to place them down on the ends of the bacon so that they would be somewhat secure and I wouldn’t have to bake the toothpicks. The first time I made them, I closely followed the recipe and I am pretty sure that those tiny wooden sticks that I put in my very hot oven caused a lot of smoke and smell (as I probably should have thought about beforehand). I also did not brush them with maple syrup because I thought the dates would make them sweet enough. It is recommended that you serve them hot, and while they are absolutely incredible that way, I don’t really mind if they are cold or room temperature when I pack them for my lunch. The texture may be a little tougher, but it still retains the sweet, spicy, and smoky flavors that make these little piggies a treat! This bento was inspired by one of my favorite dishes at a restaurant by work. Marketed as a paleo-friendly breakfast, it’s usually two eggs over easy medium (more often than not) with sausage on a bed of arugula and some other veggies. While it changes every day and is consistently good, it is $7.00. And I could easily shell out that kind of money for a tasty and filling breakfast, but I wouldn’t have the money to buy regular groceries over time. For almost the same price as the dish itself, I picked up eggs and arugula from work and bought some incredibly fresh mild Italian sausage from a local European butcher. I threw about three handfuls of arugula into the box and sauteed the sausage after removing it from the casing. I fried two eggs over easy and placed them on top, along with adding some diced avocado and diced roasted sweet potato. The trick is to pierce the yolks, mix the whole thing into a tasty, protein-filled mess and consume. I made the same salad the day before with some chorizo I had in the freezer and it was spicy, flavorful, and absolutely delicious. The whole bento takes maybe 30 minutes to make and assemble, allowing you to relish in the superiority of eating a designated serving of greens at the very beginning of the day. I recommend getting creative with whatever meats you have in your freezer and whatever greens you need to eat in your fridge, too! I have learned as I cook more that I often think to myself, “I could totally make this!” when I go out to eat. With a little time, research, and creativity, it is pretty easy to make most things that you love at restaurants. The end result can be tailored to your preferences on a whim and can spawn more ideas for how you want to cook it next time, improving the flavor so much that you might make it even better than the original! Even if you’ve burned a salad once or twice, you still have the capability to cook something delicious and simple. So go do it! Today’s unconventional breakfast is a new favorite combination, resurrecting my taste for sardines. I used to love them when I was a kid and then my affinity for them tapered off. I think the smell of someone always eating them in the breakroom at work was apparently off-putting enough that I couldn’t stomach them for a while. I have since rekindled my love for this quick and inexpensive protein resource and have been eating them frequently as if to make up for lost time. The ones I used in this bento are in harissa, adding a bit of a spicy kick. They don’t seem to have a very fragrant odor, nor are they overpoweringly salty as some can be. I toasted some fresh Ciabatta bread (although you can use whatever crusty bread with which your fancy is tickled) and spread on some homemade mayonnaise and Provencal mustard (again, whatever Dijon mustard you prefer will surely render delicious results). I added thinly sliced yellow onion, the sardines, and a pinch of black pepper. 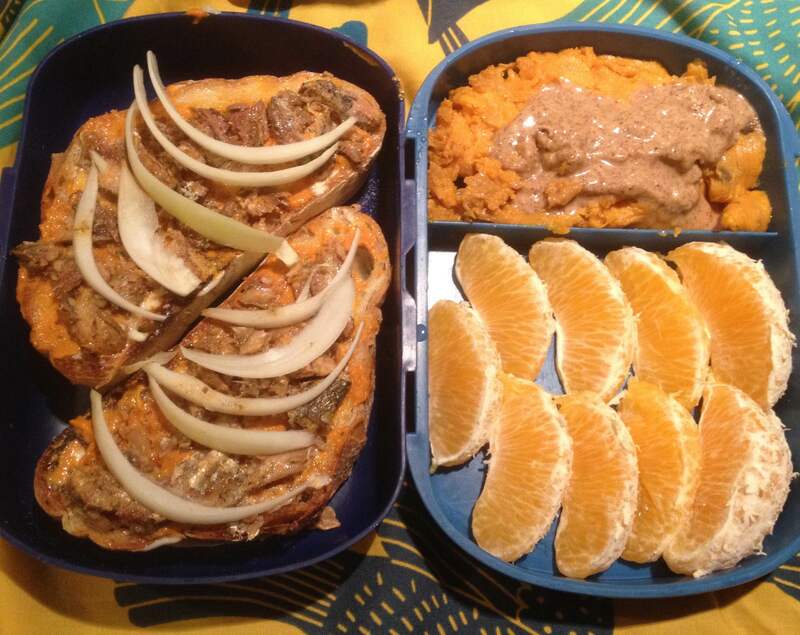 The other compartment has my staple sweet potatoes with maple almond butter and Minneola slices. Also known as a tangelo, this hybrid of a tangerine and a grapefruit looks like a friendly orange grenade and it can sometimes seem oddly hollow. They are easy to peel and don’t really contain any seeds, so it’s good for a quick snack. And it tastes so much better than grapefruit does. I keep trying to make myself like grapefruit, but thankfully minneolas make me feel like less of a masochist. I have a lot of new foods and favorites to share with everyone after my reemergence from the retail holiday season hiatus! For today’s bento, I sliced up half a piping-hot baked sweet potato and crumbled some honey goat cheese on top, along with a small handful of honey roasted sliced almonds. Recommended by one of my supervisors, this is now one of my favorite ways to eat sweet potatoes! The goat cheese’s tang is enhanced by the sweetness of both the potato and the honey, making for a decadent and relatively healthy breakfast (depending on your personal affinity for honey goat cheese). Beneath the potato is a sliced opal apple. Not super exciting, but it’s my favorite kind of apple now. It’s like a Fuji apple but on the sweeter side. Now, I love it when I’m scouring the Internet for recipes and stumble across one that happens to require ingredients that I actually have. Especially ones that desperately need to be eaten! Last night I rushed to the kitchen to make Michelle Tam’s Mango + Avocado Salsa and then tossed it with fresh baby spinach and cherry tomatoes. 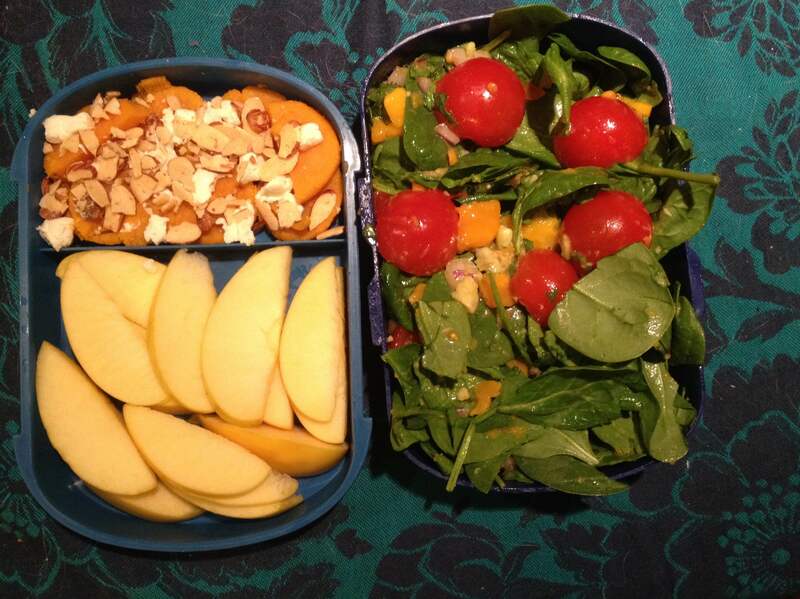 It was so tasty and refreshing that I packed it in today’s bento for breakfast! And just mix it all together! If you look to your left, you will see bites of steak on top of an otherwise dull, yet colorful salad. I should learn to not insult my food because self-deprecation has its place and this should not be it, but the steak is the shining star of this bento. It is the best steak I have ever made and I want everybody to know how to do it! Position an oven rack in the top slot of your oven and preheat to 450. Put your trusty cast iron skillet in there as it preheats to get it super hot. While the oven is preheating, get out your juicy ribeye with its beautiful marbling and brush each side with butter (I highly recommend Kerrygold Irish butter), salt and pepper. Since your oven is probably still heating up at this point, I also suggest opening a few windows and turning on the fan(s) because it may get smoky. Nothing guarantees someone scalding themselves than them trying to remove hot things from an oven while frantically trying to remember how to turn the smoke alarm off. Once the oven has preheated, carefully remove the skillet with a reliable oven mitt (I use a sturdy kitchen towel) and put it on a burner. Set the burner to medium-high heat and spoon out a tablespoon of ghee into the skillet. CAUTION: Wonderful, distracting smells are going to occur! Take some tongs and ease your hunk of meat into the pan. Sear for 30 seconds, turn over, and then sear for another 30 seconds. Then take the whole skillet (with your mitt because it’s still wicked hot) and put the whole thing in the oven for 1.5-2 minutes, flip it, and then in for another 1.5-2 minutes, depending on how you like it. I usually plate it and start hurriedly looking for a knife and fork right after, but you could leave it a bit to cool off if you are a more patient individual. 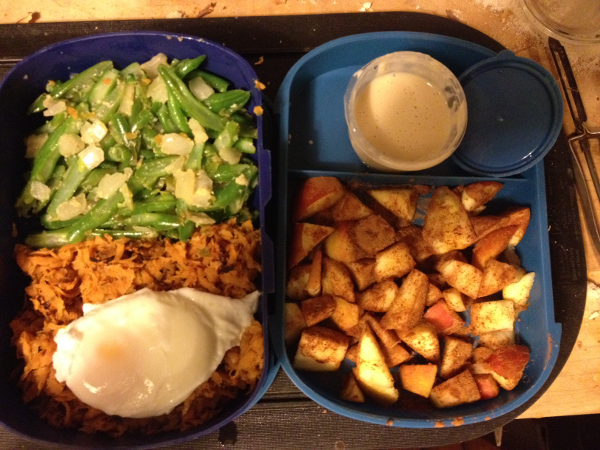 It took a lot of self-control to even allot pieces for this bento. If you’re not into seafood and feeling a bit anemic, this is your prescription. And as much as I love dietary diversity, one could not possibly make a cauliflower steak taste this good, so I do not believe there is a vegetarian alternative. Go forth and embrace your inner Ron Swanson! 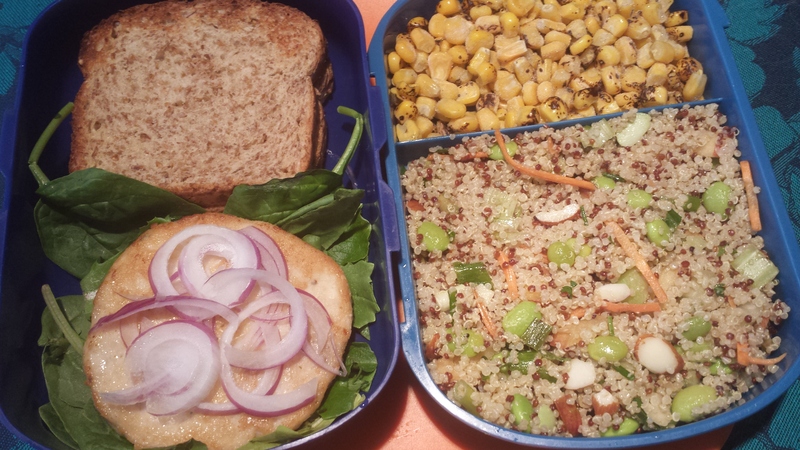 While the main course of this particular bento is a Mahi Mahi burger on sprouted bread with red onion and greens, I would like to draw your attention to the quinoa salad on the right. This salad is absolutely phenomenal and allows for you to use a lot of vegetables you may have in your fridge that are waiting ever so patiently in little sticky produce bags to magically turn into a pile of brown, indistinguishable sediment! It has the potential to become a solution to this first world problem. On the Trader Joe’s website, the recipe is called “The Edamame Energy Bowl.” I made it for a potluck tea party because it’s savory and colorful, making it a nice contrast with cakes and cookies that are almost always in excess at a potluck. I wanted to make something vegan that could feed a group of people because my friend Jill, the hostess of the tea, is vegan and I wouldn’t want to exclude her from eating something in her own house. Her favorite thing in the world is confetti and upon looking at the gorgeous colors of all the veggies in the salad, I realized that it had the same panoply of shades one would find in confetti! So I changed it to a more appropriate descriptor and it was enjoyed by all (at least to my knowledge). Prepare edamame and quinoa in separate pots according to instructions. Chop celery, green onions, parsley, apple, avocado and carrots; set aside. In a small bowl mix together lemon juice, olive oil, garlic, salt and pepper to taste. In a large bowl, combine all ingredients and sprinkle almonds on top. If preferred chilled, refrigerate an extra 20 minutes before serving. Jill and I discussed the salad after the party and pitched the idea of using different beans in the salad due to growing concern over the questionable effects of soy. As I know some people have become wary of its possible side effects, replacing the edamame with garbanzo, black, or cannelini beans might be a tasty alternative. Make this salad, clean out your fridge, and go be creative! Since my last post, life has changed dramatically for me. If you’re incredibly keen on background details, you would notice that this bento was photographed in a new location with seemingly better lighting and hints of a gas stove. I, in turn, applaud your attention to detail and would like to gleefully announce that my boyfriend and I have extracted ourselves from the shoebox we once knew by moving into a house! I have a gas stove, still no dishwasher, but I realized that having my own personal washer and dryer is vastly underrated and something I cannot live without. Until now, I did not prioritize appliances but we all change sometime. To celebrate my new kitchen, which is vastly larger than the galley I once knew, I bought one of those popularized unitasking kitchen gadgets: the Vegetti. I had been told that it is a great investment, especially if you miss pasta or just want to turn your relationship with pasta into a less soporific one. The name sounds really dirty when I tell strangers about it, but I suppose “Spagetables” wouldn’t necessarily roll off the tongue as easily. While it does only do one thing, it beats trying to be creative with my vegetable peeler. Topped with some tomato basil marinara and a bit of Parmesan, I made zucchini pasta (on the right) and, believe it or not, there are three whole zucchinis in that little tray! The results of spiraling vegetables into a big bowl elude to it being an enormous amount of faux noodles, but once cooked down with olive oil and garlic, it becomes apparent that two people could not comfortably split the portion. While it is also frustratingly difficult to clean (unless you have a dishwasher), I do recommend it for those who wish to incorporate more veggies in their diets. 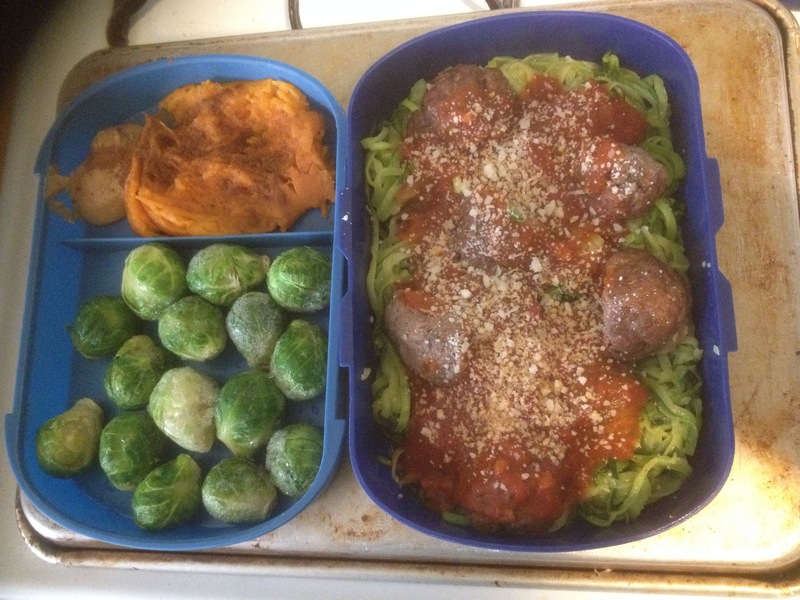 I made grass-fed beef meatballs that were edible but nothing stellar enough to recommend. To the left, I had some Brussels sprouts and baked sweet potato with cashew butter, a minor change to the typical almond butter I use. Cashew butter is creamier, a little sweeter, and quite sticky, so definitely have something to wash it down. As we’ve moved ITP, I transferred to the Midtown location for work and it is much busier than my old stomping ground. So much that if I don’t eat my lunch, I have no energy to work. Stay tuned for more posts as I try to stay full! I wish I could include musical notes in the title, but I can’t. So you’ll have to hum it yourself. It has been essentially four months since I posted anything that I have eaten or made for the general public and I feel terrible about it. Around the time of my last entry, getting my act together, hunkering down, and finishing college took precedence and my bentos had to be put on the back burner for a bit. Figuratively, of course, because who likes giant hunks of melted plastic? Anyway, with an abundance of time on my hands now, I am able to resuscitate this and take on the project of reminiscing over everything I packed and ate over the past few months because while I posted nothing, I did take pictures of just about everything. Incidentally, in my professional editing class we had to create a wee website and I, of course, created a diluted version of my blog (you can see the website here). Anyway, onward to the good stuff! I finally got to try a recipe I have been drooling over for the past month : Sweet potato hash! The original recipe recommends using a food processor to shred the sweet potato but I wasn’t about to dust of the ol’ food processor and use it because, if I haven’t mentioned it before, I do not have a dishwasher! I used a handgrater instead and I surprisingly did not injure myself! I decided to shred it all last night, too, because I had to be up wicked early this morning. I followed the spices listed and used Herbes de Provence for the dried herbs mentioned. It cooked rather quickly and I poached an egg while waiting. Because it cooked within five minutes, I was also able to sauté some green beans with garlic and onions. To the right is some cut up Honeycrisp apple with apple pie spice and a vanilla protein glaze. I cannot express just how delicious this hash is. It is so savory and pairs so well with the egg. 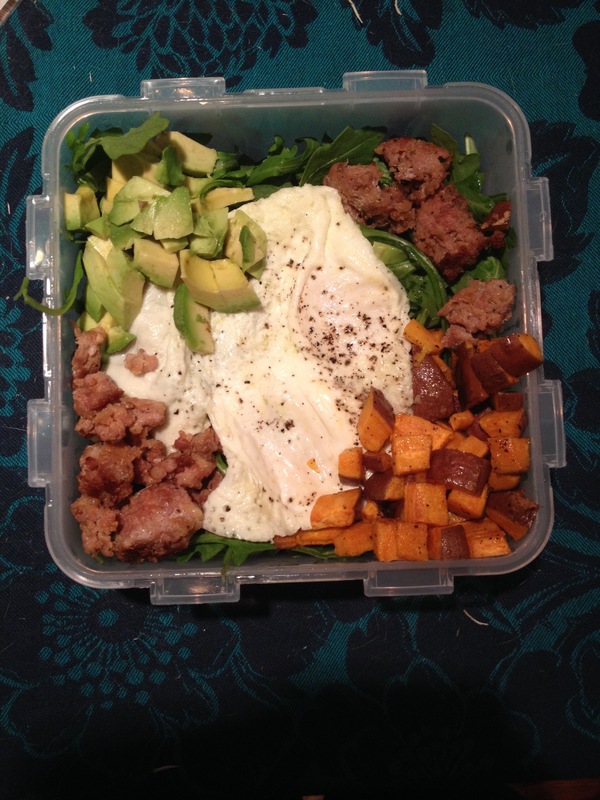 I’m so glad that I shredded an enormous sweet potato so I can make it again for breakfast tomorrow!